I get paid to make stuff up. 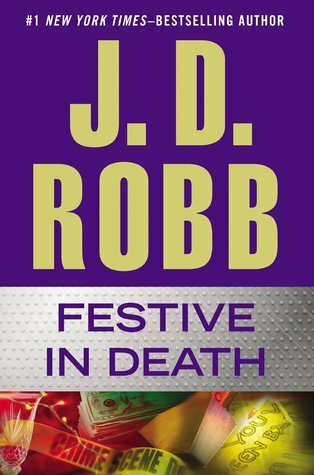 I finally got around to reading Festive in Death by JD Robb (the mystery-writing pseudonym of bestselling romance author Nora Roberts). This is the 39th book in the popular In Death futuristic mystery series, and perhaps that’s why this book is further proof that Robb/Roberts is losing her touch. At first, I thought that I wasn’t that into the book because it was my first time reading an e-book on Google Play Books, instead of my usual Amazon Kindle app. Perhaps that was the reason I kept putting the tablet down while attempting to read this book: an unfamiliar e-book delivery system. But no; when I read another book via Google Play Books, I was able to stay engaged and had a hard time putting the e-book down. So the platform delivery was not the issue; the book content was. I noticed that the quality of the In Death plots began to decline with Salvation in Death, book #27 in the series. At the time, I thought the book had a phoned-in quality, like Robb couldn’t be bothered to put forth her best efforts. Random reviews from different bookseller and fan sites showed that I wasn’t alone in my thinking; indeed, many were not pleased by the lack of her normal plot and character depth. She redeemed herself in subsequent books until she reached Indulgence in Death (book #31), which was a poor rehash of the plot of Seduction in Death (book #13). Again, all was decent until Calculated in Death (book #35, which was another poor rehash of the subplot of Born in Death, book # 23). There have long been rumors (since around the time of Indulgence in Death) that the In Death series/JD Robb books were being ghostwritten, rumors that Roberts/Robb vehemently denies. Yet continuity errors (character names, character backstories, noticeable difference in writing style from earlier books in the series, etc.) in latter books belie her denials. Given the state of the last three or so books, I’m leaning toward the ghostwriting school of thought for at least some of the books in the series. Hey, I get it: Nora Roberts has “written” forty of the JD Robb full-length novels (#40, Obsession in Death, comes out in 2015), plus short stories surrounding the main character, Lieutenant Eve Dallas of the New York Security and Police Department–all in addition to putting out her romance novels under her real name. Nora Roberts got her start, and made most of her money, writing in the romance genre (indeed, her full-length romances are almost instant bestsellers. She’s a very prolific writer who seems to churn out a new book once a month or so), and it can be argued that romances are her first writing love. That being said, it’s easy to see why she’d want to take a break as JD Robb and fall back on what made her famous. It happens. I’ve seen other of my formerly favorite authors go down the same “phone it in” path: Mary Higgins Clark and James Patterson are two of them. Patterson started the “ghostwriting via collaboration” trend that Higgins Clark is now picking up, as he turned his attention to Young Adult novels with his Maximum Ride series. Perhaps that’s what happens when you publish a certain number of books, or been in the writing and publishing game as long as they have: you become numb, writing-wise. I’ve seen it in Patricia Cornwell’s Kay Scarpetta novels; Terry Brooks‘s Dark Legacy of Shannara series (The Dark Legacy of Shannara: Witch Wraith: what was that?! ); and both Brenda Jackson‘s Madaris and Westmoreland romance series, as well. For all of these authors (who are pretty prolific), I stopped reading them on a regular basis years ago because the spark that fueled their first twenty, thirty, forty books had gone dim. I no longer enjoyed their newer offerings and found myself reading their older works (and enjoying them more). Robb/Roberts has now been added to the list. This is one of my fears as an author: writing so much that I will grow weary of my craft, and start turning out subpar stories just to say I published another book; or worse, hire someone to do most of the heavy lifting and rubber-stamp my name in order to retain and maintain my fan base. I’m not at that level yet, but given the amount of mental energy that goes into writing and publishing a book, I can see where the aforementioned authors are coming from. As Whitney Houston once sang, it’s not right, but it’s okay. © Tiffany M. Davis and Tiffscribes.com, [2014-2018]. Unauthorized use and/or duplication of this material without express and written permission from this blog’s author and/or owner is strictly prohibited. Excerpts and links may be used, provided that full and clear credit is given to Tiffany M. Davis and Tiffscribes.com, with appropriate and specific direction to the original content. This work by Tiffany M. Davis is licensed under a Creative Commons Attribution-NonCommercial-NoDerivatives 4.0 International License. Based on a work at www.tiffscribes.com.